It was a grey and miserable morning when our Bygones group boarded the Community Transport minibus at The Old Steine on Wednesday, 16 September. We were on our way to the Amberley Museum and Heritage Centre for our annual outing. Having stopped along the way to pick up Bob Cristofoli, Geoff Ridpath and Hazel Bradley, we had achieved our full complement of 10 passengers. The weather, sad to say, had deteriorated further by then – the rain had set in and, apart from a few breaks in the clouds, that was how it was to be for the duration of our visit. However, it was not all bad news. Once there, we found that many of the attractions could still be enjoyed under cover and, what is more, most of the exhibition spaces were wheelchair ­friendly. This was much appreciated by Bob and by Dave Swallow, who did a grand job of helping Bob to enjoy the day. The Wireless Exhibition, with its vintage wireless and amateur radio communications was a popular venue, as was the 1940s equipment on show at the Rural Telephone Exchange. Visits to the old Ironmongery Shop, the Machine Shop and Print Workshop were also high on the list to visit. The weather prevented us from walking around the woodside trails and the outer edges of the site, but trips on the Classic Bus and Railway were on offer to take us to the more inaccessible areas. The Limeburners Cafe, offering a good selection of snacks and meals, provided a welcome shelter from the elements and a chance for the group to meet and chat about what we'd seen on our visits to the various exhibits. 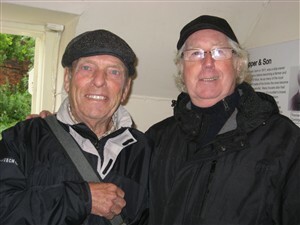 We were just a small band of “Bygoners” but, as you can see from the picture of members Geoff Ridpath and Brian Pumfrey, we made the best of our day out, the rain didn't spoil our day too much – we were in the company of friends, which was most important. And for those who might be inspired to visit Amberley again (hopefully on a sunny day) it's possible to arrive by public transport, as it's right next to Amberley railway station.